Anger is an outdated emotion. In the distant past our ancestors had a much harder time than we do today. Imagine a time where meeting strangers could mean a potential death if they were hostile. Our Ancestors needed, in order to survive the ability to create a genuine emotion that could intimidate and cause fear in people they did not know. This was Anger, which could also produce a rush of energy to run or continue to fight when injured. We still have the same caveman physiology, we still have the same potential to react with anger and rage - yet we also have the ability to control this behavior and change. Imagine how much better off you will be when you are able to remain calm and collected, or even take some time out to process how you are feeling rather than simply react with rage. This will also lead to getting more trust and respect by gaining control of your anger. Through hypnosis you can access the subconscious mind and harness its ability to reprogram patterns of behavior, such as responding angrily to everyday situations. Get started today and remove this primitive automatic response from being your first call of action (or indeed your only option) and make life easier for yourself by having behavioral choices that are rational and lack the emotional intensity of how you used to be. 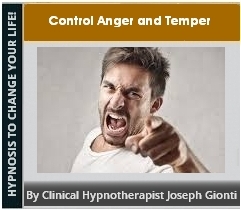 Don't allow your anger or temper to control you any longer - download your Control Anger and Temper program now!